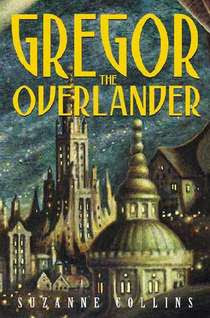 Gregor the Overlander was written by Suzanne Collins. It is book 1 of 5 in The Underland Chronicles. In this accessible, almost-cinematic fantasy, Gregor and his two-year-old sister fall into an amazing underground world. Taken in by people who have lived beneath the earth for centuries, the 11-year-old learns about the giant-sized talking creatures that also reside there, including bats, cockroaches, and vicious rats. Gregor just wants to get home, but a prophecy hints that he may be the "overlander" destined to save the humans from the warlike rodents. He is reluctant until he learns that his father, who disappeared from their New York City home a few years before, is a prisoner of the rats. Gregor is not an eager hero, but with common sense, quick thinking, and determination he grows into the role. His sister, who provides some comic relief, also plays a key part because of her ability to befriend creatures, especially the giant cockroaches. Plot threads unwind smoothly, and the pace of the book is just right. Exciting scenes and cliff-hanger chapters are balanced by decisions and interactions that drive the action. Gregor is not the most compelling figure at first, but as the story progresses he becomes more interesting, maturing through the challenges he faces. Supporting characters are generally engaging, particularly the enigmatic warrior rat that claims to support the protagonist's mission. This is an engrossing adventure for fantasy fans and for those new to the genre. When I completed the Hunger Games Trilogy I just hadn't had enough of Suzanne Collins. While The Underland Chronicles is definitely a younger "young adult" series... I wasn't disappointed. While the books made for a very easy read, they still kept me interested and kept my imagination going. I rushed through all 5 books just dying to know how each book ended. And then... I was sorry I was so quick to read them. I really think that another book should be added to the series. Suzanne Collins could definitely take a look into the future of the characters I think.